Yes, that would be 12 points. (That’s a lot. 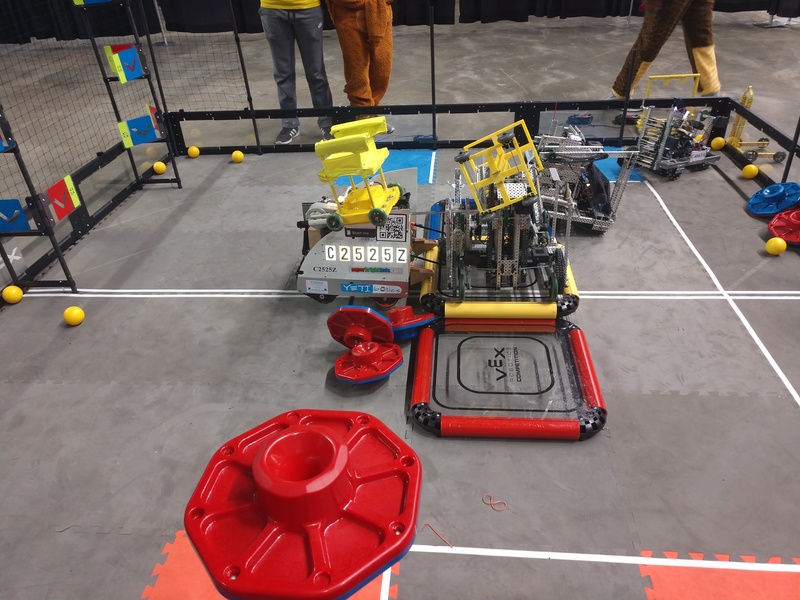 1 high flag is 2, so it’s like you scored all of the high flags) The way you side park is ingenious, though I expect you’ll get a LOT of resistance from other robots due to the time it takes. I’m surprised nobody else tried to do that for side parking. Good robot! Can’t comment other than that, because it’s mostly non-VEX, but it looks good! The reason people don’t try that for side parking, as you say, is because it takes so much time. Very #Innovative though. Pretty clever. Especially if you can figure out how to lock that piston, then you will be technically center parked while not taking up much of the platform. Is this legal in VEX VRC? No. This is for the US Open division. It’s pretty much modified Turning Point. This close to Worlds, probably not. But it’s still really cool! Yah I was thinking about that but just to give teams a leg up I don’t think it would take that long to build out of vex parts. Yes thanks for the compliment we worked hard. By any chance are you also affiliated with a VRC team? Wanted to share our first successful double park at the US Open. Good luck at world’s! Saw this when I was at the Open and thought it was the coolest parking mechanism, and just skirts by the clamping rule. Making the wedges isn’t the hard part, it’s the propping up on the ball and getting the park done in time that’s the hard part. Single ball possession for shooting was a sacrifice we were willing to deal with. That being said, the actual park only takes a few seconds to get the wheels a 1/2 inch off the ground. We never actually climbed onto the high platform. Just a quick fingertip push-up on our preload.